Download "Processing and Settling Credit Cards"
1 13 Processing and Settling Credit Cards FTD Mercury provides the capability to process credit cards directly within the application. If you have a high-speed Internet connection (DSL, broadband, etc. ), you can also take advantage of processing credit cards over the Internet, eliminating the need for an additional phone line. Credit Card Tasks» Processing Credit Cards» Voice Authorizing Credit Cards» Manually Authorizing Credit Card Transactions» Searching for Credit Card Transactions» Handling Unsettled Credit Card Authorizations (including resending unapproved transactions and deleting declined transactions) FTD Cash-Flo Credit Card Program As an FTD Member, you do not have to look any further than the FTD Cash-Flo Program to find the very best credit card service in the floral industry. Offering complete credit card processing services for all Members, the program includes electronic recording of transactions and authorization service and equipment. 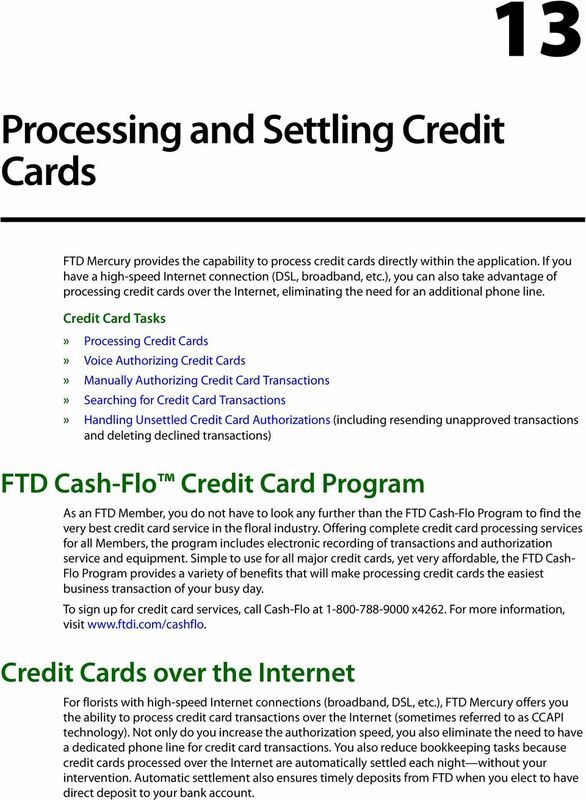 Simple to use for all major credit cards, yet very affordable, the FTD Cash- Flo Program provides a variety of benefits that will make processing credit cards the easiest business transaction of your busy day. To sign up for credit card services, call Cash-Flo at x4262. For more information, visit Credit Cards over the Internet For florists with high-speed Internet connections (broadband, DSL, etc. ), FTD Mercury offers you the ability to process credit card transactions over the Internet (sometimes referred to as CCAPI technology). Not only do you increase the authorization speed, you also eliminate the need to have a dedicated phone line for credit card transactions. You also reduce bookkeeping tasks because credit cards processed over the Internet are automatically settled each night without your intervention. Automatic settlement also ensures timely deposits from FTD when you elect to have direct deposit to your bank account. 2 13 2 Chapter 13 Processing and Settling Credit Cards To sign up for credit card processing over the Internet, contact Mercury Technology Sales at Once you have signed up to process credit cards over the Internet, you need to configure your system to do so using the Credit Cards screen in Mercury Administration. For more information, see Credit Cards Screen on page IMPORTANT You must be processing Credit Cards over the Internet to install FTD Mercury X. Processing Credit Cards To accept a credit card as payment for an order, simply enter the order in Order Entry or Point of Sale and click Complete. When the Payments window opens, either swipe the credit card, or enter the credit card information. Ensure you select whether the customer is present for the sale. If you swipe the credit card, FTD Mercury will display the information in the payments grid. If you have not yet entered customer information, FTD Mercury automatically performs a customer lookup by credit card number when you swipe the card. If FTD Mercury finds a match, the customer information is displayed in the Payments window. If more than one customer matches the lookup, FTD Mercury displays all matches and allows you to select the correct customer. If the credit card number is not already associated with a customer, the system associates the credit card number with the customer entered in the Customer area. If you are using the Point of Sale module, and you are using the default customer or no customer, the system does not associate the credit card number with any customer. The Approval Process The approval process takes place after you click Complete in the Payments window. 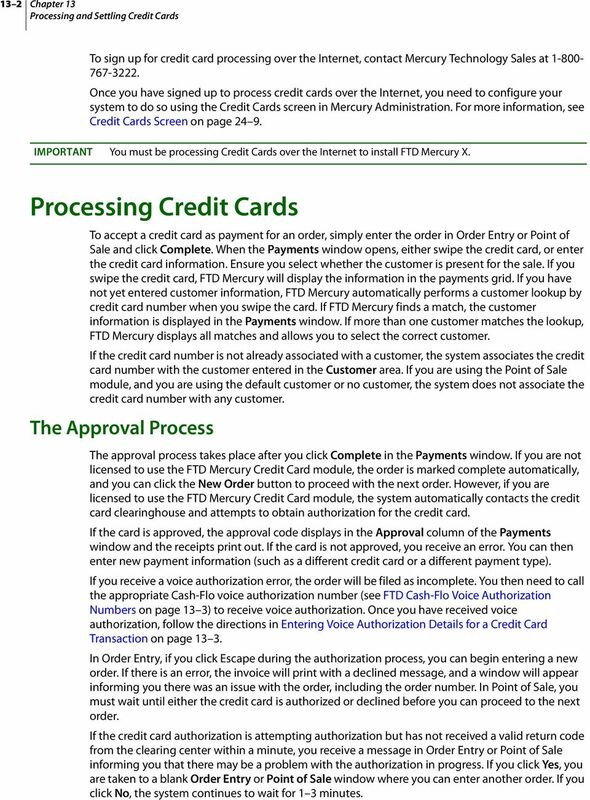 If you are not licensed to use the FTD Mercury Credit Card module, the order is marked complete automatically, and you can click the New Order button to proceed with the next order. However, if you are licensed to use the FTD Mercury Credit Card module, the system automatically contacts the credit card clearinghouse and attempts to obtain authorization for the credit card. If the card is approved, the approval code displays in the Approval column of the Payments window and the receipts print out. If the card is not approved, you receive an error. You can then enter new payment information (such as a different credit card or a different payment type). If you receive a voice authorization error, the order will be filed as incomplete. You then need to call the appropriate Cash-Flo voice authorization number (see FTD Cash-Flo Voice Authorization Numbers on page 13 3) to receive voice authorization. Once you have received voice authorization, follow the directions in Entering Voice Authorization Details for a Credit Card Transaction on page In Order Entry, if you click Escape during the authorization process, you can begin entering a new order. If there is an error, the invoice will print with a declined message, and a window will appear informing you there was an issue with the order, including the order number. In Point of Sale, you must wait until either the credit card is authorized or declined before you can proceed to the next order. If the credit card authorization is attempting authorization but has not received a valid return code from the clearing center within a minute, you receive a message in Order Entry or Point of Sale informing you that there may be a problem with the authorization in progress. If you click Yes, you are taken to a blank Order Entry or Point of Sale window where you can enter another order. If you click No, the system continues to wait for 1 3 minutes. 3 Processing Credit Cards 13 3 Changing the Price for a Credit Card Order Prior to Settlement Before a credit card transaction has been settled, you still have an opportunity to change the price of the order. You may, for example, need to change a delivery or product price, or you may want to add to the order. You cannot make changes after the transaction has been settled. To change the price for an already placed credit card order (if the transaction has not been settled): 1 On the FTD Mercury Main Menu, click Order Entry or Point of Sale, depending on where the order was originally entered. 2 Click Lookup. The Ticket Search window opens. 3 Click the Customer tab. 4 Enter the customer s name in the text box and click Search. 5 Double-click the ticket you want to change to open it in Order Entry or Point of Sale. 6 Make changes to the product or delivery amounts as necessary. 7 Click Payment. 8 In the Payments grid, change the value of the Amount column to equal the amount displayed in the Total field. 9 If an unassigned remainder payment is present below the credit card payment (or, for multipayment transactions, if an unassigned remainder is present below the other payment types and credit card payment), right-click on the unassigned remainder payment and click Remove. 10 Click Complete. The sale is approved with the new total. Voice Authorizing Credit Cards Voice authorizations are done if you receive an error or message to contact the credit card company, or if the card was previously rejected and you want to receive verbal authorization from your credit card clearinghouse. 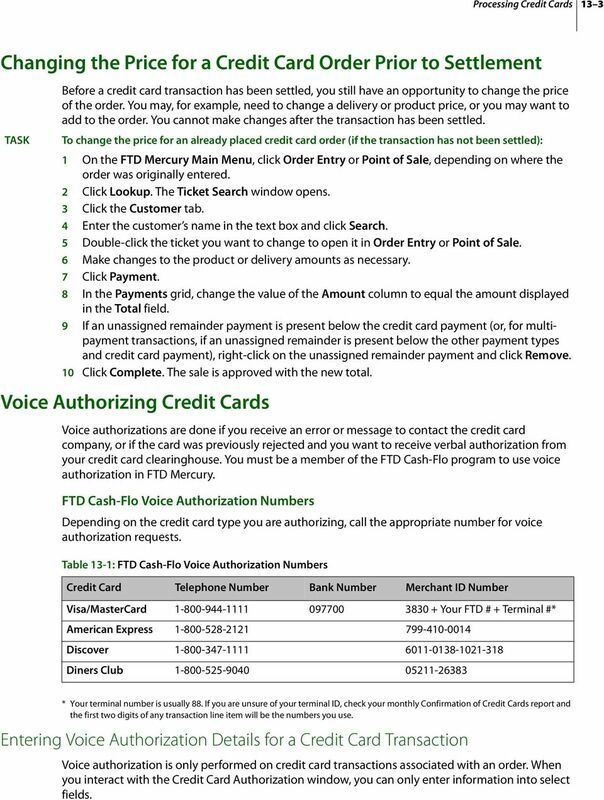 You must be a member of the FTD Cash-Flo program to use voice authorization in FTD Mercury. FTD Cash-Flo Voice Authorization Numbers Depending on the credit card type you are authorizing, call the appropriate number for voice authorization requests. Table 13-1: FTD Cash-Flo Voice Authorization Numbers Credit Card Telephone Number Bank Number Merchant ID Number Visa/MasterCard Your FTD # + Terminal #* American Express Discover Diners Club * Your terminal number is usually 88. If you are unsure of your terminal ID, check your monthly Confirmation of Credit Cards report and the first two digits of any transaction line item will be the numbers you use. Entering Voice Authorization Details for a Credit Card Transaction Voice authorization is only performed on credit card transactions associated with an order. When you interact with the Credit Card Authorization window, you can only enter information into select fields. 4 13 4 Chapter 13 Processing and Settling Credit Cards NOTE To enter voice authorization for a credit card transaction: 1 On the Credit Cards menu, click Voice/Resend Authorization. The Unsettled Credit Card Authorizations window opens. 2 From the Store Name list, select your store name. 3 Click Search. 4 Locate the transaction you are entering voice authorization for from the results list and click Voice. The Credit Card Authorization window opens. 5 In the Cardholder area: a. In the Name field, verify the cardholder s name. b. In the Address field, verify the cardholder s address. c. From the Present list, the selected option. 6 In the Approval area, in the Code field, enter the code provided to you by your credit card clearinghouse. 7 Click Send. If you are using Direct Dial as your credit card processing mechanism, you will hear the Comm Pool dial out on FTD Mercury. Once FTD Mercury contacts the credit card clearinghouse, the transaction is authorized. Manually Authorizing Credit Card Transactions Although rare, it may be necessary to manually authorize a credit card transaction. For instance, if you changed accounting systems and had already recorded a sale, but not processed the credit card, you may need to perform this task. NOTE To manually authorize a credit card: 1 On the Credit Cards menu, click Manual Authorization. The Credit Card Authorization window opens. 2 In the Sale area, in the Amount field, enter the amount for the transaction. 3 If this is a refund, select the Refund check box. 4 In the Card area: a. In the Number field, enter the card number. The Type field will automatically populate with the credit card type based on the card number. b. In the Expiration field, enter the expiration date for the card in MM/YYYY format. 5 In the Cardholder area: a. In the Name field, enter the name as it appears on the credit card. b. In the Address field, enter the cardholder s address. c. From the Present list, select if the cardholder was present (and, if not, how the order came to you). 6 Your store name is listed by default in the Store Name field. If you have multiple stores, click the arrow and select the name of the store for which you are authorizing this credit card transaction. 7 Click Send. If you use dial up to process credit cards, you will hear the Comm Pool dial out for the authorization. FTD Mercury will contact the credit card clearinghouse for authorization. 5 Processing Credit Cards 13 5 Credit Card Authorization Window The Credit Card Authorization window serves two purposes. First, for voice authorizations, it allows you to enter the voice authorization code provided by your credit card clearinghouse and receive authorization for that transaction. 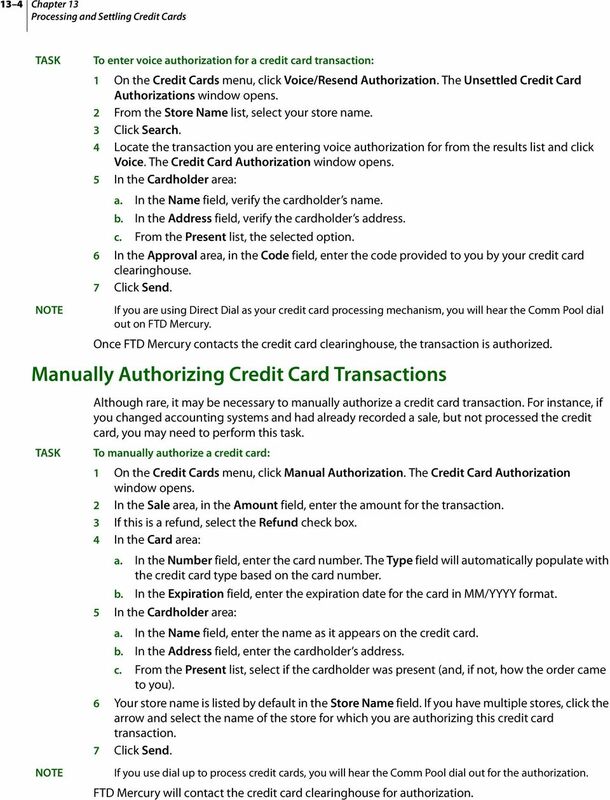 You can also manually enter a credit card transaction that is not associated with an order in FTD Mercury, including providing a refund to a credit card. 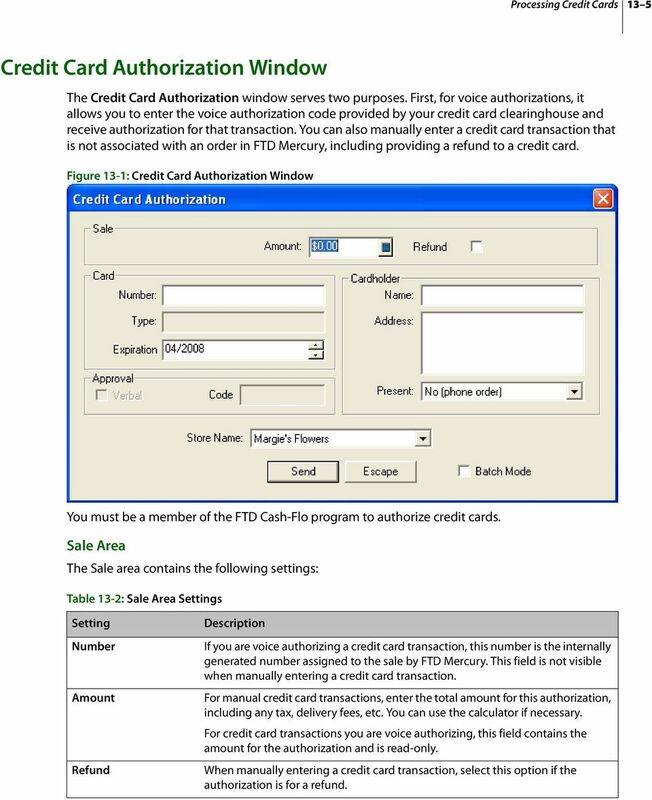 Figure 13-1: Credit Card Authorization Window You must be a member of the FTD Cash-Flo program to authorize credit cards. Sale Area The Sale area contains the following settings: Table 13-2: Sale Area Settings Setting Number Amount Refund If you are voice authorizing a credit card transaction, this number is the internally generated number assigned to the sale by FTD Mercury. This field is not visible when manually entering a credit card transaction. For manual credit card transactions, enter the total amount for this authorization, including any tax, delivery fees, etc. You can use the calculator if necessary. For credit card transactions you are voice authorizing, this field contains the amount for the authorization and is read-only. When manually entering a credit card transaction, select this option if the authorization is for a refund. 6 13 6 Chapter 13 Processing and Settling Credit Cards Card Area The fields in this area are read-only for voice authorizations. For manual credit card transactions, you must enter the information. Table 13-3: Card Area Fields Field Number Type Expiration Enter the card number. The type automatically populates based on the card number. Enter the expiration date for the card in MM/YYYY format (that is, if the card expires in May of 2009, enter 05/2009). 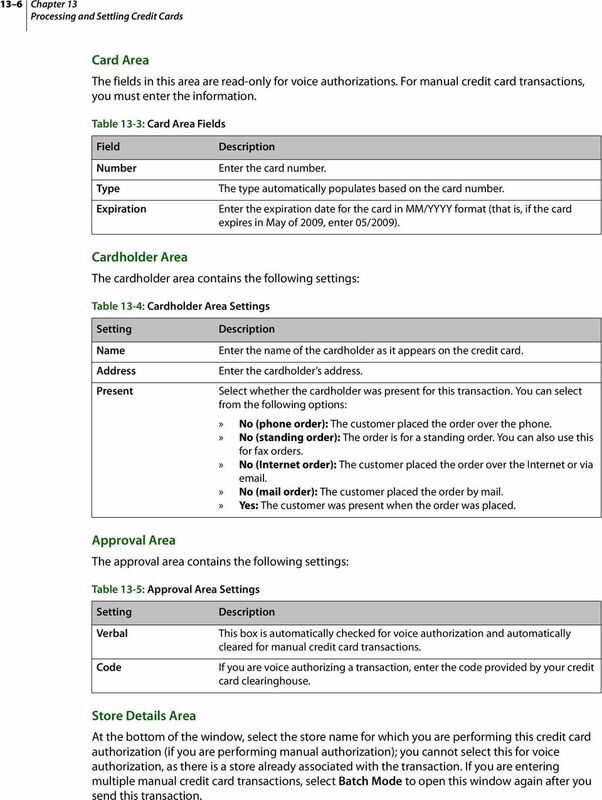 Cardholder Area The cardholder area contains the following settings: Table 13-4: Cardholder Area Settings Setting Name Address Present Enter the name of the cardholder as it appears on the credit card. Enter the cardholder s address. Select whether the cardholder was present for this transaction. You can select from the following options:» No (phone order): The customer placed the order over the phone.» No (standing order): The order is for a standing order. You can also use this for fax orders.» No (Internet order): The customer placed the order over the Internet or via .» No (mail order): The customer placed the order by mail.» Yes: The customer was present when the order was placed. Approval Area The approval area contains the following settings: Table 13-5: Approval Area Settings Setting Verbal Code This box is automatically checked for voice authorization and automatically cleared for manual credit card transactions. If you are voice authorizing a transaction, enter the code provided by your credit card clearinghouse. Store Details Area At the bottom of the window, select the store name for which you are performing this credit card authorization (if you are performing manual authorization); you cannot select this for voice authorization, as there is a store already associated with the transaction. If you are entering multiple manual credit card transactions, select Batch Mode to open this window again after you send this transaction. 7 Processing Credit Cards 13 7 When you have completed this window, click Send. If you process credit cards over dial up, you will hear the Comm Pool dial out. 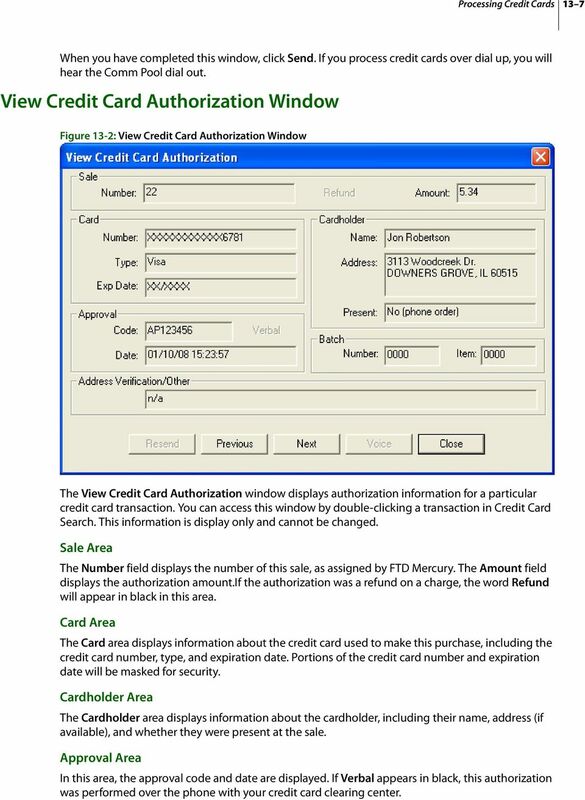 View Credit Card Authorization Window Figure 13-2: View Credit Card Authorization Window The View Credit Card Authorization window displays authorization information for a particular credit card transaction. You can access this window by double-clicking a transaction in Credit Card Search. This information is display only and cannot be changed. Sale Area The Number field displays the number of this sale, as assigned by FTD Mercury. The Amount field displays the authorization amount.if the authorization was a refund on a charge, the word Refund will appear in black in this area. Card Area The Card area displays information about the credit card used to make this purchase, including the credit card number, type, and expiration date. Portions of the credit card number and expiration date will be masked for security. Cardholder Area The Cardholder area displays information about the cardholder, including their name, address (if available), and whether they were present at the sale. Approval Area In this area, the approval code and date are displayed. If Verbal appears in black, this authorization was performed over the phone with your credit card clearing center. 8 13 8 Chapter 13 Processing and Settling Credit Cards Batch Area This area displays the settlement batch number and the item number of this authorization in this batch. These are system-assigned numbers. Address Verification/Other Area This area displays the address verification service (AVS) response or detail about an ERROR message. Click Close to close this window. Searching for Credit Card Transactions To search for a credit card transaction: 1 On the Search menu, click Credit Card Search. The Credit Card Search window opens. 2 In the Search Parameters area, enter the transaction number, credit card number, or name of the credit card holder and click Search. Transactions matching your search criteria appear in the results list below the Search Parameters area. Once you have located the credit card transaction, you can perform several tasks on it, including:» Viewing Credit Card Transactions from the Credit Card Search Window» Resending Credit Card Transactions from the Credit Card Search Window» Voice Authorizing Credit Card Transactions from the Credit Card Search Window» Deleting Unapproved Credit Card Transactions from the Credit Card Search Window Viewing Credit Card Transactions from the Credit Card Search Window To view details for a credit card transaction: 1 On the Search menu, click Credit Card Search. The Credit Card Search window opens. 2 In the Search Parameters area, enter the transaction number, credit card number, or name of the credit card holder and click Search. Transactions matching your search criteria appear in the results list below the Search Parameters area. 3 From the results list, double-click the transaction you want to view. Transaction details appear in the View Credit Card Authorization window. When you have finished viewing the transaction, click Close to return to the Credit Card Search window. Resending Credit Card Transactions from the Credit Card Search Window To resend a credit card transaction for authorization: 1 On the Search menu, click Credit Card Search. The Credit Card Search window opens. 2 In the Search Parameters area, enter the transaction number, credit card number, or name of the credit card holder and click Search. Transactions matching your search criteria appear in the results list below the Search Parameters area. 3 Select the transaction you want to resend for authorization and click Resend. When you are finished, click Close to close the Credit Card Search window. 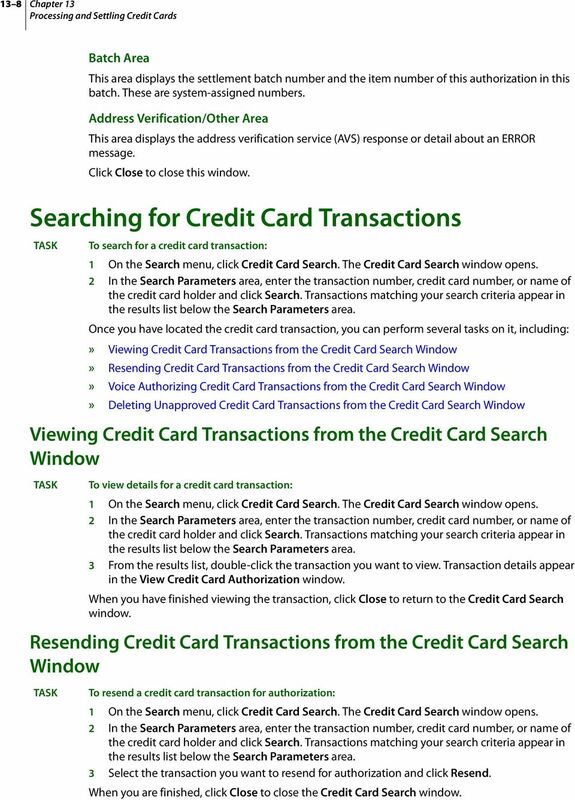 9 Searching for Credit Card Transactions 13 9 Voice Authorizing Credit Card Transactions from the Credit Card Search Window NOTE To perform voice authorization on a credit card transaction: 1 On the Search menu, click Credit Card Search. The Credit Card Search window opens. 2 In the Search Parameters area, enter the transaction number, credit card number, or name of the credit card holder and click Search. Transactions matching your search criteria appear in the results list below the Search Parameters area. 3 Select the transaction you want to resend for authorization and click Voice. The Credit Card Authorization window opens. 4 In the Cardholder area: a. In the Name field, enter the cardholders name. b. In the Address field, enter the address for the cardholder. c. From the Present list, select whether the cardholder is present for the transaction. 5 In the Approval area, in the Code field, enter the approval code provided by your credit card clearinghouse. 6 Click Send. If you are using Direct Dial as your credit card processing mechanism, you will hear the Comm Pool dial out on FTD Mercury. Once FTD Mercury contacts the credit card clearinghouse, the transaction is authorized. Deleting Unapproved Credit Card Transactions from the Credit Card Search Window You can only delete authorizations that were entered manually and not associated with a sale or payment. 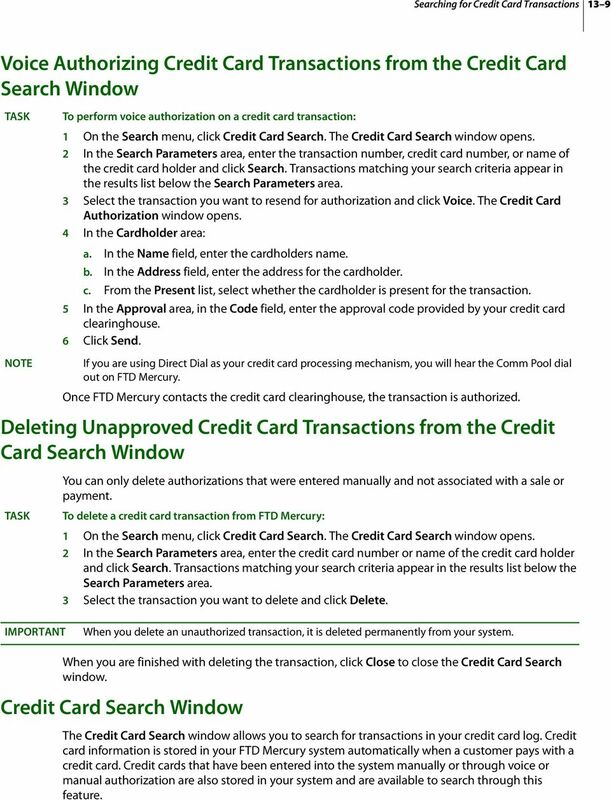 To delete a credit card transaction from FTD Mercury: 1 On the Search menu, click Credit Card Search. The Credit Card Search window opens. 2 In the Search Parameters area, enter the credit card number or name of the credit card holder and click Search. Transactions matching your search criteria appear in the results list below the Search Parameters area. 3 Select the transaction you want to delete and click Delete. IMPORTANT When you delete an unauthorized transaction, it is deleted permanently from your system. When you are finished with deleting the transaction, click Close to close the Credit Card Search window. Credit Card Search Window The Credit Card Search window allows you to search for transactions in your credit card log. Credit card information is stored in your FTD Mercury system automatically when a customer pays with a credit card. Credit cards that have been entered into the system manually or through voice or manual authorization are also stored in your system and are available to search through this feature. 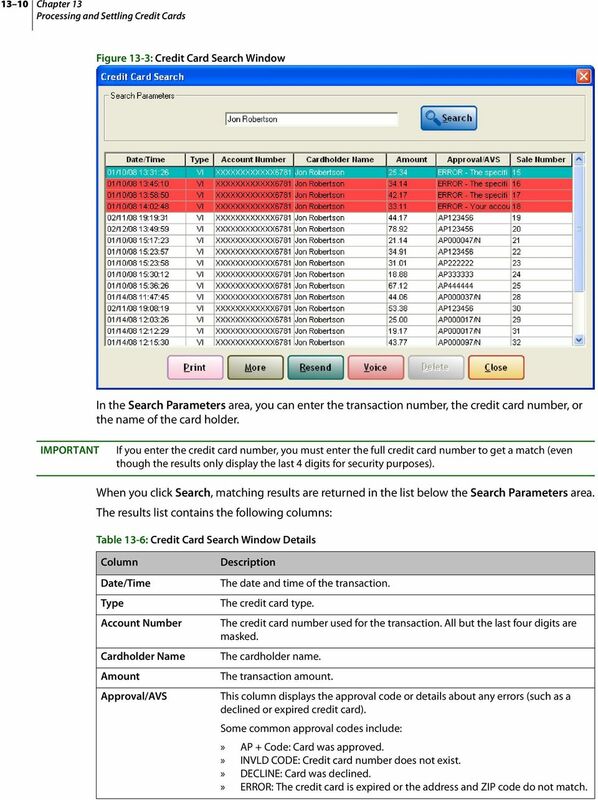 10 13 10 Chapter 13 Processing and Settling Credit Cards Figure 13-3: Credit Card Search Window In the Search Parameters area, you can enter the transaction number, the credit card number, or the name of the card holder. IMPORTANT If you enter the credit card number, you must enter the full credit card number to get a match (even though the results only display the last 4 digits for security purposes). When you click Search, matching results are returned in the list below the Search Parameters area. The results list contains the following columns: Table 13-6: Credit Card Search Window Details Column Date/Time Type Account Number Cardholder Name Amount Approval/AVS The date and time of the transaction. The credit card type. The credit card number used for the transaction. All but the last four digits are masked. The cardholder name. The transaction amount. This column displays the approval code or details about any errors (such as a declined or expired credit card). Some common approval codes include:» AP + Code: Card was approved.» INVLD CODE: Credit card number does not exist.» DECLINE: Card was declined.» ERROR: The credit card is expired or the address and ZIP code do not match. 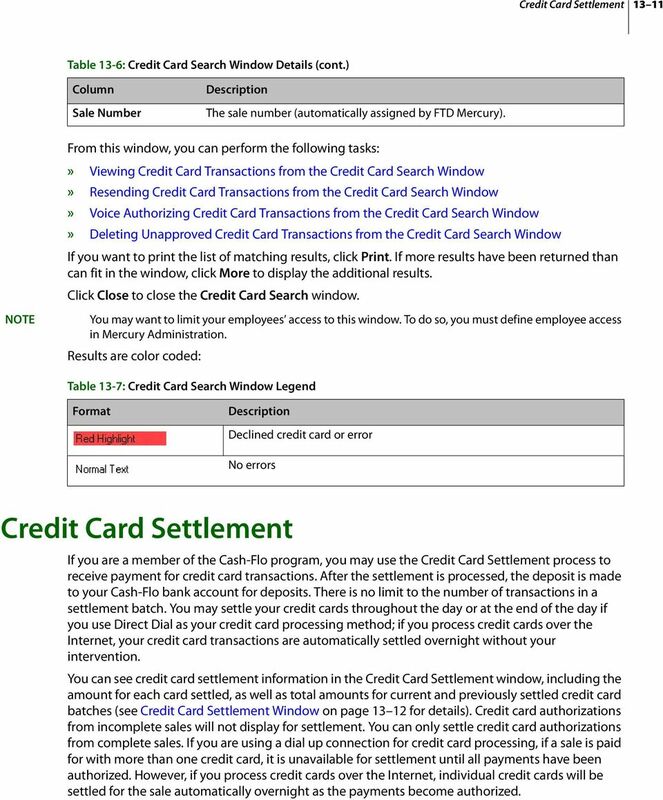 11 Credit Card Settlement Table 13-6: Credit Card Search Window Details (cont.) Column Sale Number The sale number (automatically assigned by FTD Mercury). NOTE From this window, you can perform the following tasks:» Viewing Credit Card Transactions from the Credit Card Search Window» Resending Credit Card Transactions from the Credit Card Search Window» Voice Authorizing Credit Card Transactions from the Credit Card Search Window» Deleting Unapproved Credit Card Transactions from the Credit Card Search Window If you want to print the list of matching results, click Print. If more results have been returned than can fit in the window, click More to display the additional results. Click Close to close the Credit Card Search window. You may want to limit your employees access to this window. To do so, you must define employee access in Mercury Administration. Results are color coded: Table 13-7: Credit Card Search Window Legend Format Declined credit card or error No errors Credit Card Settlement If you are a member of the Cash-Flo program, you may use the Credit Card Settlement process to receive payment for credit card transactions. After the settlement is processed, the deposit is made to your Cash-Flo bank account for deposits. There is no limit to the number of transactions in a settlement batch. You may settle your credit cards throughout the day or at the end of the day if you use Direct Dial as your credit card processing method; if you process credit cards over the Internet, your credit card transactions are automatically settled overnight without your intervention. You can see credit card settlement information in the Credit Card Settlement window, including the amount for each card settled, as well as total amounts for current and previously settled credit card batches (see Credit Card Settlement Window on page for details). Credit card authorizations from incomplete sales will not display for settlement. You can only settle credit card authorizations from complete sales. If you are using a dial up connection for credit card processing, if a sale is paid for with more than one credit card, it is unavailable for settlement until all payments have been authorized. However, if you process credit cards over the Internet, individual credit cards will be settled for the sale automatically overnight as the payments become authorized. 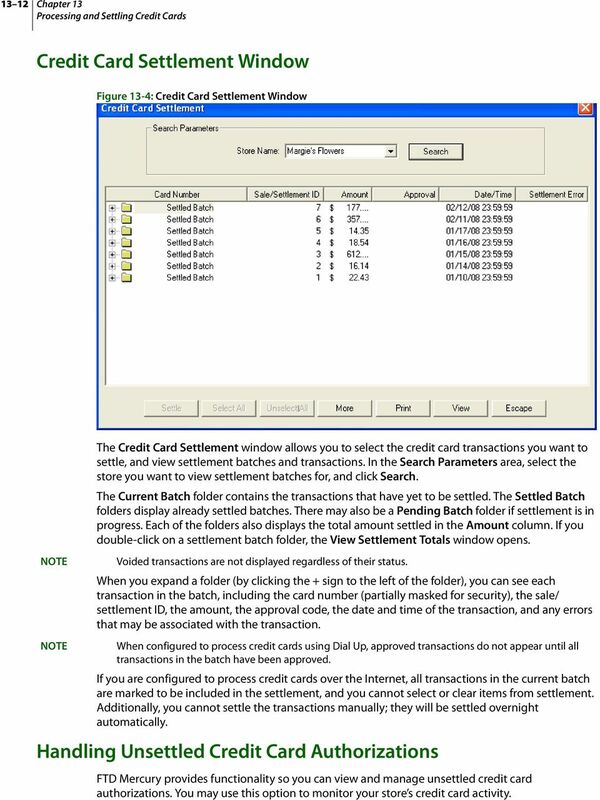 12 13 12 Chapter 13 Processing and Settling Credit Cards Credit Card Settlement Window Figure 13-4: Credit Card Settlement Window NOTE NOTE The Credit Card Settlement window allows you to select the credit card transactions you want to settle, and view settlement batches and transactions. In the Search Parameters area, select the store you want to view settlement batches for, and click Search. The Current Batch folder contains the transactions that have yet to be settled. The Settled Batch folders display already settled batches. There may also be a Pending Batch folder if settlement is in progress. Each of the folders also displays the total amount settled in the Amount column. If you double-click on a settlement batch folder, the View Settlement Totals window opens. Voided transactions are not displayed regardless of their status. When you expand a folder (by clicking the + sign to the left of the folder), you can see each transaction in the batch, including the card number (partially masked for security), the sale/ settlement ID, the amount, the approval code, the date and time of the transaction, and any errors that may be associated with the transaction. When configured to process credit cards using Dial Up, approved transactions do not appear until all transactions in the batch have been approved. If you are configured to process credit cards over the Internet, all transactions in the current batch are marked to be included in the settlement, and you cannot select or clear items from settlement. Additionally, you cannot settle the transactions manually; they will be settled overnight automatically. Handling Unsettled Credit Card Authorizations FTD Mercury provides functionality so you can view and manage unsettled credit card authorizations. You may use this option to monitor your store s credit card activity. 13 Credit Card Settlement NOTE To view and manage unsettled credit card authorizations: 1 On the Credit Cards menu, click View Unsettled Authorizations. The Unsettled Credit Card Authorizations window opens. 2 In the View Parameters section, use your mouse to select whether you want to View Approved, View All, or View Unapproved credit card authorizations. 3 By default, your store name appears in the Store Name field. If you have multiple stores, click the arrow and select the name of the store for which you wish to view unsettled authorizations. 4 Click Search. A list of transactions displays below the View Parameters section. You can then view details for a transaction by double-clicking it, resend it for approval by selecting it and clicking Resend, perform voice authorization for the transaction by clicking Voice, or delete the transaction by selecting it and clicking Delete. Depending on whether the transaction has been approved, some of these tasks may be unavailable. For example, the Delete button is only enabled for manually authorized credit card transactions that have not been settled; you cannot delete other credit card transactions, so Delete will not be enabled for these other transactions. If you delete an unsettled credit card transaction, it is removed permanently from your system. 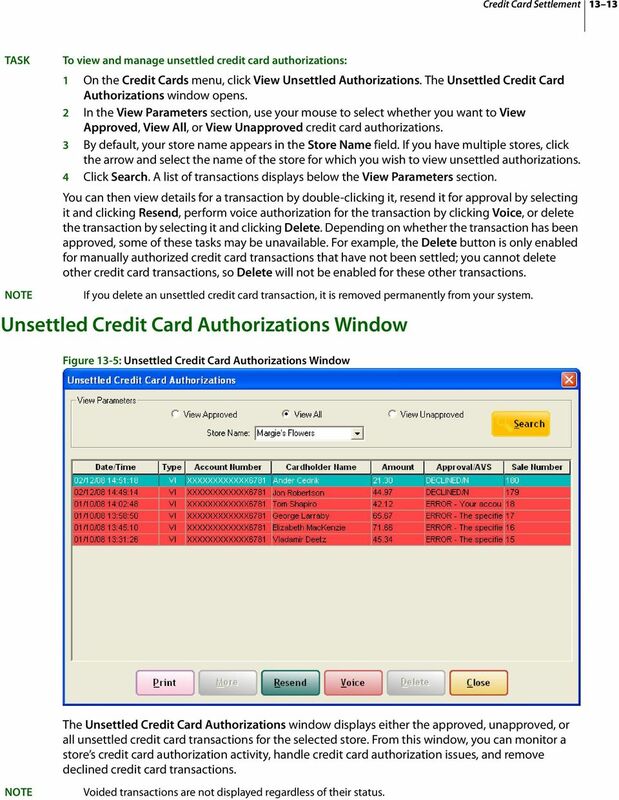 Unsettled Credit Card Authorizations Window Figure 13-5: Unsettled Credit Card Authorizations Window The Unsettled Credit Card Authorizations window displays either the approved, unapproved, or all unsettled credit card transactions for the selected store. From this window, you can monitor a store s credit card authorization activity, handle credit card authorization issues, and remove declined credit card transactions. NOTE Voided transactions are not displayed regardless of their status. 14 13 14 Chapter 13 Processing and Settling Credit Cards View Parameters Area The View Parameters area allows you to select the criteria for the results list. You can select whether you want to view approved, unapproved, or all unsettled credit card authorizations. You must select the store name for which you are viewing unsettled credit card authorizations, and click Search to display a list of matching results. Results List After you have configured your search parameters, unsettled credit card authorizations matching your search criteria appear in the results list. Each unsettled authorization includes the following information: Table 13-8: Results List Column Date/Time Type Account Number Cardholder Name Amount Approval/AVS Sale Number The date and time of the transaction. The credit card type. The credit card number. The cardholder name The transaction amount. Displays the approval code for authorized transactions or the status of unauthorized transactions. If this transaction has yet to be sent for authorization, the column will be blank. If there is an error, the column will display ERROR. If the authorization is pending, this column will display PENDING. The internally generated sale number associated with the transaction. Buttons At the bottom of the window, there are several buttons that allow you to perform actions on the selected unsettled credit card authorization. 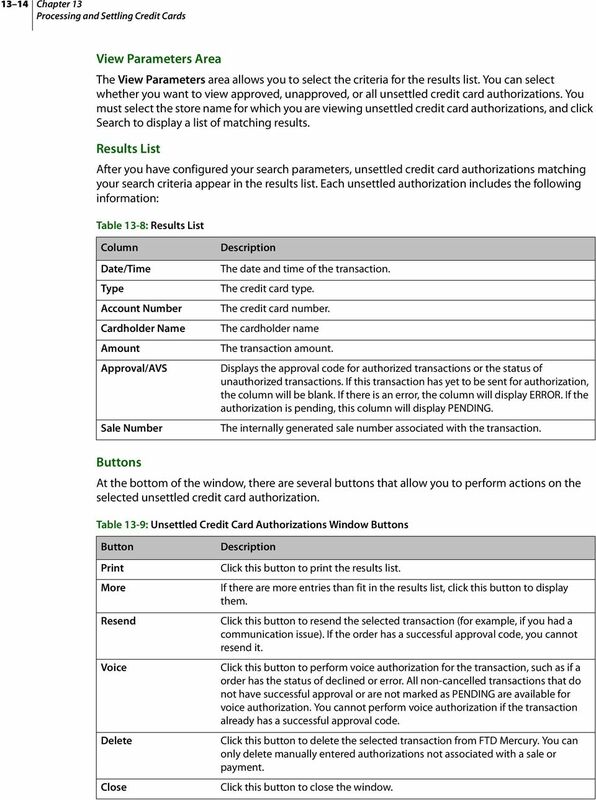 Table 13-9: Unsettled Credit Card Authorizations Window Buttons Button Print More Resend Voice Delete Close Click this button to print the results list. If there are more entries than fit in the results list, click this button to display them. Click this button to resend the selected transaction (for example, if you had a communication issue). If the order has a successful approval code, you cannot resend it. Click this button to perform voice authorization for the transaction, such as if a order has the status of declined or error. All non-cancelled transactions that do not have successful approval or are not marked as PENDING are available for voice authorization. You cannot perform voice authorization if the transaction already has a successful approval code. Click this button to delete the selected transaction from FTD Mercury. You can only delete manually entered authorizations not associated with a sale or payment. Click this button to close the window. 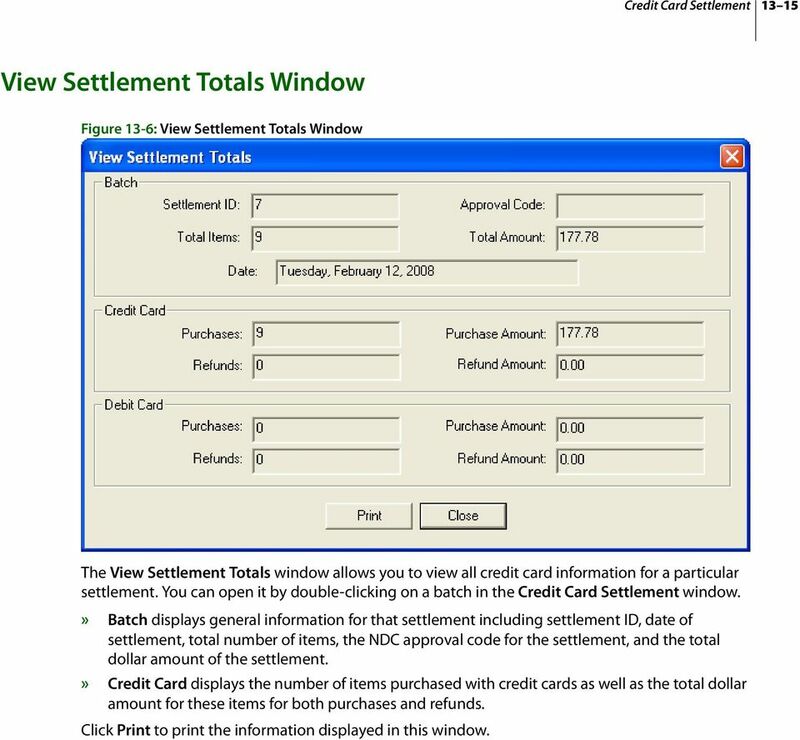 15 Credit Card Settlement View Settlement Totals Window Figure 13-6: View Settlement Totals Window The View Settlement Totals window allows you to view all credit card information for a particular settlement. You can open it by double-clicking on a batch in the Credit Card Settlement window.» Batch displays general information for that settlement including settlement ID, date of settlement, total number of items, the NDC approval code for the settlement, and the total dollar amount of the settlement.» Credit Card displays the number of items purchased with credit cards as well as the total dollar amount for these items for both purchases and refunds. Click Print to print the information displayed in this window. Opening the FTD Document Center. Double-click the FTD Document Center icon on your Windows desktop. Element Payment Services is a third party software system that processes credit card and automatic bank account (ACH) transactions through PestPac. ROI Credit Card Processing. ROI Check Verification. Copyright 2000 by MaddenCo, Inc All rights reserved.